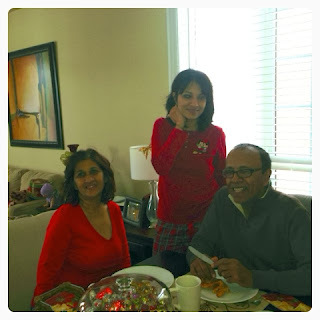 it's my girls' world: Christmas Morning Fun! 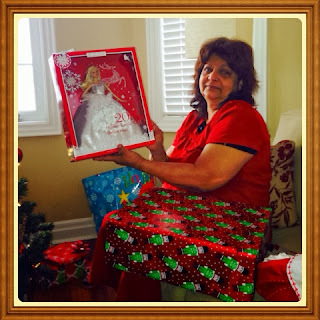 This Christmas was beautiful, bountiful and blessed. Beautiful in that it was a white, snowy, pretty Christmas Day. It was freezing but we didn't have to leave the house so we were able to enjoy our winter wonderland through our windows. The festive Christmas ornaments, joyous carols and white snowy background all contributed to that special Christmas feeling. Bountiful in that all that we had around us. 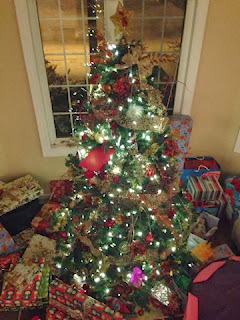 As you can see below, and that was only a cross section of the gifts, we had lots and lots of presents. Even though we were very mindful of what we gave, I think everyone was very pleased with all that Sarita Santa brought them. I was also so touched by all that I received. There was also lots and lots of food and drink and many helping hands. Darin and I took care of breakfast and the ladies took care of dinner. We each took a couple dishes though so it wasn't too much work for any one of us. 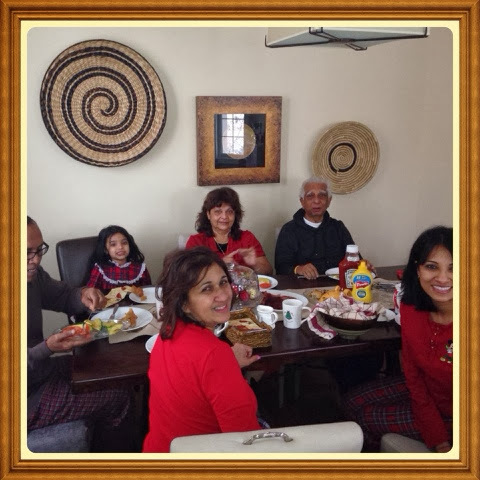 We were also incredibly blessed as we had both sets of grandparents here to enjoy Christmas with our little family of four. This was the first time in seven years that all four grandparents braved these cold temperatures to come to Canada and experience Christmas with us. Three generations all under one roof. It just made our holidays that much more special. We played games, chatted, cooked, watched movies, drank and ate! Lots!!! 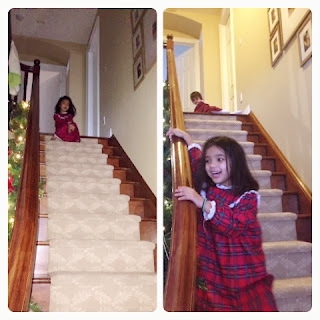 Enjoy our photos from Christmas morning. 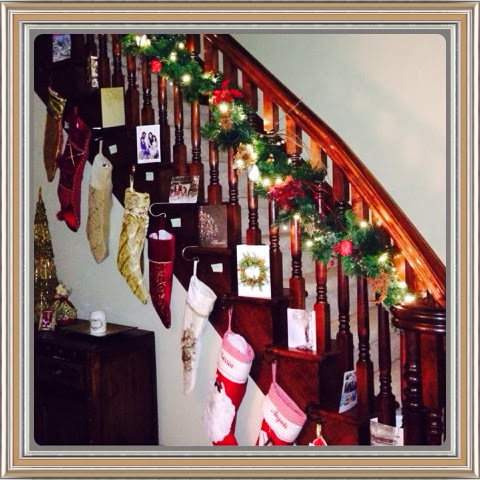 The stockings are hung by the staircase with care. First C was waiting at the top of the staircase until we told her she could come down. 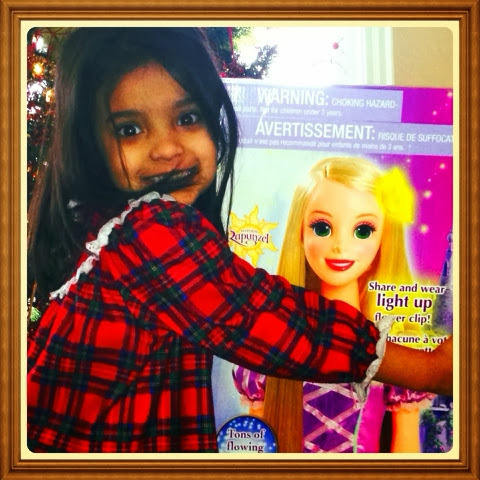 I love her face when she saw the spoils that Santa brought us. Check sweet A in the background. My kids opening their presents was lots of fun but I must say that one of my very favourite moments of the entire holidays was when my mother-in-law received this present from me. She really wanted a Holiday Barbie 2013. She kept asking about it and it was sold out in a couple places. I finally found it online but we all had to keep making excuses not to go to the stores to check for it. When she opened it and saw what it was, she got so emotional and so happy. We all were affected as well. A doll with her very own life-size doll. 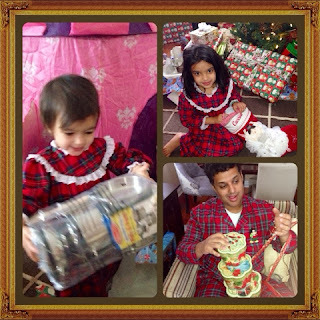 Let's just say there were lots of dolls as presents this Christmas. Both girls also got American Dolls from my mother in law and then there were Santa's dolls and Grandma's dolls too. We're good with dolls for the next five years. Then it was time for breakfast! Hope everyone enjoyed their Christmas morning! Your blog is really very good. I love to read your blog. I like to read blogs in my free time and your blog is one of interest. You are always having good posts in your blog and you are always active in the blog. Thank you so much sharing this post.